If you asked me last week if AHQ E-Sports Club was going to sweep Taiwan's LoL Master Series, I'd have tried not to laugh in your face—it would have been impolite, and I like the players, even if they seem to be suffering a bad identity crisis. Sure, GreenTea was slumping; sure, Albis's jungle playmaking was questionable; sure, Riot nerfed literally everything in Westdoor's stable of champions. But I owed them a little loyalty, still, for making NaMei cry last October. If you asked me, last month, if I thought that Unicorns of Love would be an EU LCS finalist, I'd have probably been sarcastic at you. They were exciting rookies, yes, but exciting rookies are basically gung-ho blood knights that care more for KDA than craftiness. Yes, it was fun to cheer them on, and it was great that they weren't shy to show competence on off-meta champions, but it's largely been correct to assume that playing off-meta meant playing strategies with notable flaws or weaknesses exploitable by the current dominant paradigm. Yes, the meta changes with every patch—but competitive picks have solid reasoning behind them. 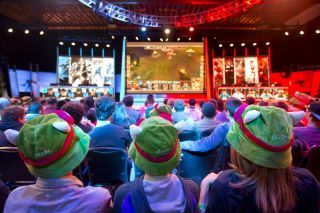 If you asked me earlier if I thought I understood competitive League of Legends, I'd have shrugged and said "yes." I've covered it too long to say otherwise. I'm also not so sure these days. We're at the half-way point for April. Next month, the Mid-Season Invitationals at Tallahassee, Florida. And the game is looking strange these days. Nautilus's been dredged up from the depths of obscurity to play support, Udyr's been spotted running around in Korea, of all regions, and teams we thought would take it all at the start of spring have struggled to adapt to this brave new world of Urgot mids. Here's what I think we can expect Asia to bring to Florida. Okay, this might be me cheating a tiny bit: Taiwan's LoL Master Series was the first of the five premier circuits to conclude its spring season, and they did so just literal hours ago. But it's worth noting what a freaking shock the end results were. AHQ replaced one of their two star players and bumped a key member to a new role just for the playoffs—a move that seemed desperate when they revealed it against Toyz and Stanley's Hong Kong Esports, and something that still leaves me flabbergasted. But the numbers don't lie, and the performance was convincing. During the regular spring split, Albis's jungling left me largely unconvinced—though he had a good reputation in scrims, his personal mechanics and positioning wasn't particularly noteworthy on-stage, especially compared to Karsa's brilliant flair. On a lower-pressure position like support, however, that reputed shot-calling was given more focus while his personal contributions was curtailed to peeling and off-tanking in strictly teamfight situations. That had mindblowing effect on AHQ's cohesion. Let me remind you: they were fourth and lowest of the playoff teams, and the first of the veteran teams to drop a game to the LMS rookies. For them to then blast both HKE and the Taipei Assassins down in back-to-back 3-0 sets was a shock to everybody. For them to take down the Yoe Freaking Flash Wolves 3-1? Given how absolutely ridiculous their teamfighting was against both Hong Kong Esports and Yoe Flash Wolves, teams that built their reputation on how well they get into scraps, I might be forced to be excited about them. Fine, Westdoor; fine, Albis. You promised us. You said, before a packed stadium, that you would take down the Koreans. At the very least, I expect them to match YFW and make it to semifinals. Whoops. We might have heard this tune before. Back when sister teams was the norm in South Korea, CJ Entus Blaze had an undefeated split too—only to flounder at the last second. In retrospect, it was kind of obvious why: when you peak so early and hold the throne for so long, you become the only real target on everybody's list, and there are vanishingly few teams that can thrive under that sort of constant pressure. So it wasn't entirely surprising that SKT toppled the Tigers off their throne. The gap between the two had steadily closed over the season, and Korean analysts were even saying it was just a matter of time. The real surprise, though, is that they did it without Bengi: the coup de grace on the Tigers was done by rookie hands as new jungler Tom swept in with notably more aggressive play-making. That makes SKT the odds-on favorites to secure the Korean seed at MSI. Yet I hesitate to be excited about this. Tom's professional performances have been very promising, but he's also yet to demonstrate how well he plays under adverse situations—specifically, whether he can stand getting strategically focused, or how he handles his team falling behind. Or even how he handles a diet of American food and a 12+ hour time zone change! We're a far cry from the Korean dominance of the last two years, where even their mid-tier teams could sweep internationally. Faker might still be considered the best mid laner in the world, but even the best mid laner in the world needs his jungler to remain upright and untilted, capable of carving out enough space amid this meta of tanks and more tanks for the greatest LoL magician alive to work his magic. Of course, just because a team is at the absolute pinnacle of its region doesn't mean it's doomed to fall. CJ Blaze was in a situation where it was pulling out wins against teams within spitting distance of its caliber of play—you can tell that it had rivals it absolutely must take seriously to maintain their record. Edward Gaming can play half-asleep and make the second-best LPL team look bad. The end-of-split LPL spectacle is hilarious, but probably not for the right reasons. Because of how playoffs are seeded, teams were heavily incentivized to do whatever they can to avoid the EDG matchup—a situation that resulted in the most ridiculous, most obviously sandbagged games in Chinese esports history. Nominally against the rules, of course. But I don't blame them, nor do I expect anybody to get punished over it. EDG is an unsolved mystery for everybody, everywhere. To put in context just how much fear that team has cast over an entire hemisphere, it's worth remembering that the Asian circuits aren't like EU and NA. They're close enough, and even culturally related enough, that cross-region scrimming is a common occurrence between Chinese, Korea and Taiwanese top teams. You might, rightfully, think that the Taiwanese teams have a bit of a short straw in this arrangement—but this year, it isn't the Korean teams that have them scared. And it'd be inaccurate to say the average Chinese team's got them bothered either. It's all about EDG. It's all about Aaron's boys. China's most controversial coach has established a reign of terror, and I fully expect them to make the MSI an object lesson for everybody else. Meanwhile, off to the west, Unicorns of Love dragged SK Gaming through a surreal romp in a land where Gnar Jungle works and Orianna can steal Baron against two enemy Smites. What sort of tactical inflexibility makes these off-meta picks work against the team nominally considered Europe's best at present time? What communicative and mechanical deficiency makes it so that roughly 1,500 points of true damage leaves 200 HP behind for Power of Evil's Orianna to clean up? Don't get me wrong—as caster Quickshot would say, I was thoroughly entertained by the set. But even my scrappy little Taiwanese teams don't have these weird basic shortcomings to work through. I just don't have a lot of confidence in western teams at this time. While it seems as if they're doing a good job of refining what they've got, with TSM in particular showing excellent polish, refining a smaller potential doesn't mean much versus China and Korea's gargantuan wealth of raw talent. I can only see TSM doing well on behalf of the combined western hemisphere bracket—and only if they fix chronic issues with Dyrus and Wildturtle's positioning. Sure, Dyrus baiting teams to their death is almost a meme now—solely focusing the TSM top laner doesn't do anything to handle their real threats, even if he does feed four times in a row. But unlike mid-tier American teams, the rest of the world has decent mid laners too that will benefit grossly from the gold bounties TSM's weakest players have a tendency to give up. In fact, just as much as Bjergsen does from everybody else's weakest targets. Yet, I find myself enthusiastic for America's chances for once, and even tempted to cheer Team Solomid on. But the reason for it's got more to do with their European players than any sense of patriotism. I have been waiting since 2013 for Bjergsen to face down Faker. Two years ago, a young and powerful new Danish mid laner stepped into the European limelights, almost at the same time as Korea's hottest talent was recruited by South Korea Telecom to play for their second League of Legends team. For two years, I've waited for the day that these two would meet in combat—wondering at what brilliant sparks would result from their conflict. With luck, I will wonder no longer.